Five military veterans are hiking the Pacific Crest Trail and stopped at the American Legion Post 800 for a reception and dinner. Four are part of “Warrior Hike: Walk off the War” and the fifth had been hiking solo but joined the group in Julian. 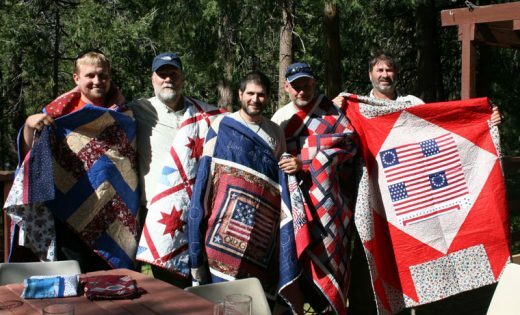 Chris Finney presented quilts made by Mountain Quilters of Idyllwild to the five — from left, dubbed the “tag along,” Joe Thompson, U.S. Marines; Dan Janes, Navy; Ruben Munoz, Navy; Joe Jamison, Army; and Jimmy Sellers, Army. This is the third year PCT Warrior Hikers have come through Idyllwild to the legion event. In what is becoming an annual event, the Idyllwild American Legion Post 800 hosted a reception and dinner for American military veterans who are hiking the Pacific Crest Trail. Residents attended to talk, eat and drink with the Warrior Hikers. “Warrior Hike: Walk off the War” is a program developed by Marine veteran Sean Gobin to help returning combat-zone vets gradually ease back into civilian life. Gobin hiked the 2,185 Appalachian Trail in 2012 immediately after he returned from three combat deployments in Iraq and Afghanistan and saw the health benefits for returning combat vets. Originally, five vets were scheduled to hike the PCT in 2016. One, Navy vet Albert Woolum, the oldest of the vets, left the trail unable to continue. That left Joe Jamison, Army; Dan Janes, Navy; Ruben Munoz, Navy; and Jimmy Sellers, Army, to complete the mission. Ex-Marine Joe Thompson, who was solo hiking the PCT, met Munoz coming out of Julian and decided to join the group for the rest of the journey. At the post, hikers swapped service stories with legion vets and attending residents, and spoke about the importance of the Warrior Hike program. Dan Janes, affable and articulate, hiked the Appalachian Trail last year. “The goal of the program is to bring the outdoor community and the veterans together,” said Janes. “We tell our stories and are getting respect from everyone we talk to, on the trail and in the towns. We’re making friends.” Janes said the glue that holds the Warrior Hikers together is how every night, in their camp, they talk directly to each other about their deployments — the tension, the stress, losing comrades and buddies. He noted how those conversations are bonding this group together. And in conversation with them, including newcomer Thompson, it is clear that they are already a tightly knit unit, dedicated to their primary mission — letting those they encounter know about the plight of military combat vets — whether it is about post-traumatic stress and other psychic injuries, physical impairments suffered in combat, high rates of suicide of those returning from combat deployments or the condition of medical care for veterans as provided through the U.S. Department of Veterans Affairs. “Warrior Hike: Walk off the War,” is established on all three of the national trails — the Pacific Crest, Appalachian and the Continental Divide — as well as the Arizona, Buckeye (Ohio), Florida, Ice Age (Wisconsin), Trans America (Oregon to Virginia) and most recently added, the Mississippi River, a vet kayak expedition from Minnesota to Louisiana. For more about Warrior Hikes and Gobin’s mission in establishing the program, visit https://warriorexpeditions.org/contact-us/.